An Ilocos kakanin you usually notice being peddled in the Ilocos Sur capital city of Vigan, Candon Kalamay is a kalamay variant whose recipe consists of the usual kalamay ingredients of sugar, rice flour and coconut meat, with the sticky sweet traditionally wrapped in banana leaves, but now wrapped in plastic strips or polysterene. 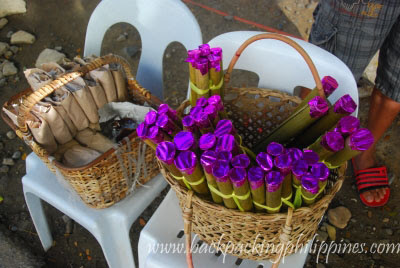 Other well-known kalamay variants include, Bohol kalamay, baguio kalamay (popularly known as sundot kulangot), Iloilo kalamay, Nilubyan of Tarlac made from pounded green rice and Mindoro kalamay using grated coconut and flavored with peanut butter or vanilla. Candon City celebrates Kalamay Festival in March of every year. 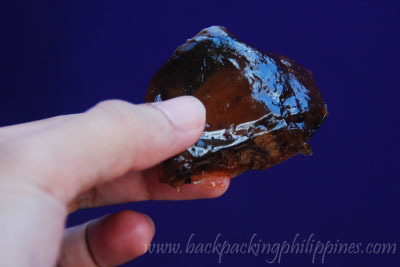 Funny, i never knew what kalamay was made out of until i read this post. I've always eaten it when my titas would bring it to the house but up until this blog i was oblivious as to what it was! thanks for the informative post!